What says summer fun better than a beach ball? Take advantage of the remaining dog days of summer by having custom beachballs made for your party or special event! Also beach balls are great marketing tools as they can display a sizable logo to get your business name or special event out there and noticed! Summer isn't over! Order Your Custom Beach Balls Today! Beach balls, by themselves, evoke fun, happiness, and leisure. Use these qualities to enhance your brand or enliven a corporate event or a party for a special someone! Who can resist tossing around a beach ball once it is introduced to a crowd? Suddenly that dull presentation comes alive as the audience engages in passing the beach ball around the venue. All the while, everyone gets a view of your company logo, colors and perhaps a mission statement. Personalized beach balls can be used for parties. Why not send them to guests as invitations with your pool or beach party info printed on the balls? Since the beach balls come deflated and flat, they are easy to mail. And best of all, guests can bring their beach ball invitations to toss around on the beach or pool. Are you a independent music band? Have beach balls made with your band name to toss out at the crowd during an outdoor (or indoor) concert. It will be a great souvenir for fans, new and old, to take home. Go for the largest size balls for the the biggest impact! Company picnics can get the whole work force laughing and having a great time by giving away these fun and colorful inflatables with the company logo proudly printed on them as gifts. Retail businesses can influence a boost in sales at the end of summer for a special sale or promotion. Draw shoppers to your business with these fun giveaways with each purchase or give them away with a clever marketing message on them so to entice customers back to your store in the future. Beach balls are great promotional tools for pool supply stores, outdoor sports and camping stores, but really any retail store can use "attention magnets!" 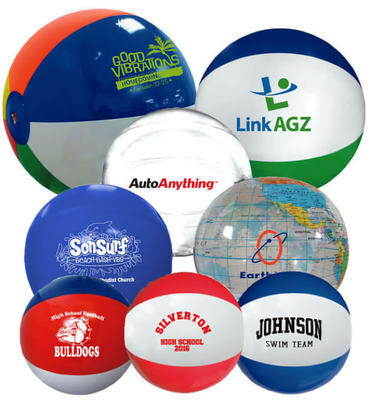 Promotional beachballs are available in a whole assortment of sizes, colors and patterns. There is a beach ball perfect for your end of the summer needs, if you can’t decide on one, we will help you narrow your choices! We are confident there is a beach ball that suits you needs. Go to our Beach Ball pages today and explore our huge variety! Summer’s not over, but hurry! Fall is not far away.